Seems like Sonam Kapoor and Anand Ahuja are making the most of their me time in Delhi (going by the couple’s recent Instagram posts). 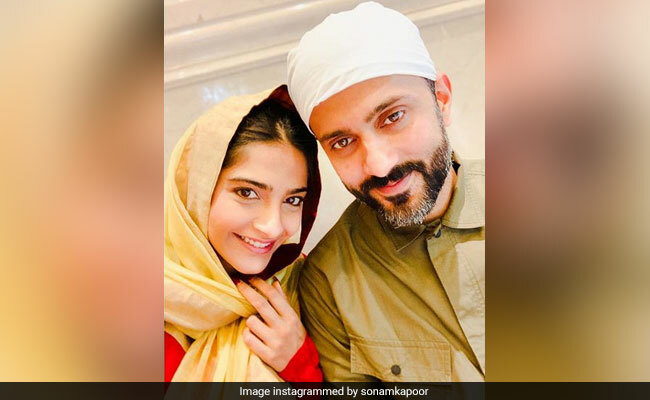 On Saturday, Sonam shared a loved-up picture of herself along with her husband Anand Ahuja on her Instagram profile. The picture reminds of why we just can’t seem to get enough of the couple’s social media PDA. In the picture, Sonam can be seen wearing a dupatta over her head. Just like us, the actress’ fans too loved the picture and wrote comments such as “cutest couple ever” and “perfect picture”. Sonam shared the post with her 17.3 million followers on Instagram, of which over 3 lakh fans have liked the picture. Meanwhile, Sonam Kapoor’s husband Anand Ahuja also shared another adorable picture of himself along with Sonam and his brother Anant Ahuja. In the selfie, the trio can be seen happily smiling. The photograph received over 1 lakh likes within a few hours. On the work front, Sonam Kapoor was last seen in Ek Ladki Ko Dekha Toh Aisa Laga. Her next film is The Zoya Factor, which is based on the book written by Anuja Chauhan. The film also stars Dulquer Salmaan, Sikander Kher and Angad Bedi. Sonam Kapoor and Anand Ahuja got married in May last year. Anand Ahuja is an entrepreneur. He runs the fashion label Bhane and the sneaker boutique VegNonVeg.